The Seicomart supply chain was created to encompass everything from sourcing and producing to manufacturing, logistics and retail. We are now working towards maximising the full potential and function of each division, to offer our customers high quality products with affordable low prices by evolving the Seicomart supply chain into the Secoma group principles and structure. Using the newly established ‘Secoma Brand’ as the focus, we have restructured our business operations into three divisions: ‘Sourcing & Manufacturing’, ‘Logistics & Services’ and ‘Retail Businesses’. 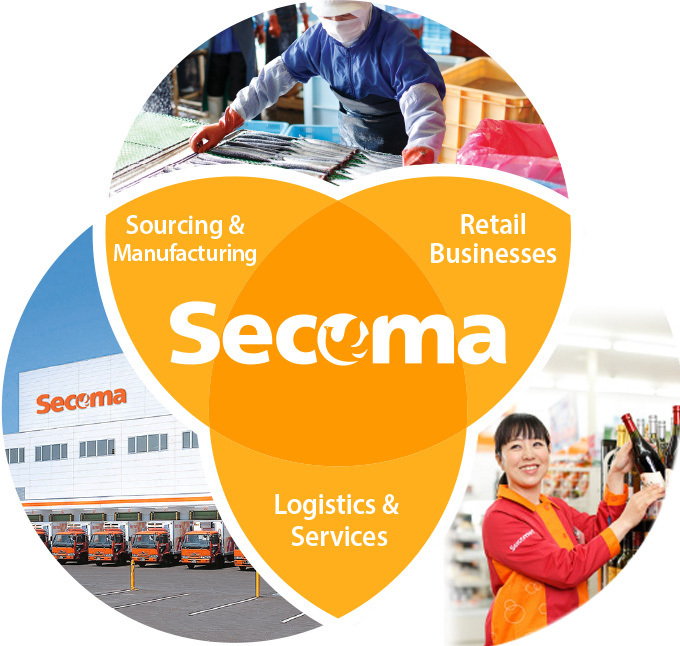 By allowing independence, we increase our business scope and nurture each company within the group so that Secoma can continue to provide products and services that satisfy our customers, increasing the value of Hokkaido brand equities. We will continue to pursue these new business structures and principles in the future. Click each division to view the names of the group businesses involved. We plan and manage the Secoma brand from farming through to manufacturing. Each company, spanning from; agriculture, fishery, food and beverage manufacture as well as many others, strive to grow in scale and productivity to achieve stability through Secoma brand principles. Our high standard products are made with the fresh, superior quality ingredients found in Hokkaido. We continually strive to increase our functionality and value as a food company. We are also concentrating our strengths on the planning and development of products that our customers will enjoy, while simultaneously promoting the uniqueness of Hokkaido. We fervently believe that there is a strong link between sharing revenue with our employees and the revitalization of the local area through the promotion of industries and job creation. We have independently created 18 major logistic centres in Hokkaido and 4 in Honshu, enabling us to offer a wide range of services. Beyond deliveries to our Seicomart stores, we also assist other companies with their logistical needs relating to store distribution. We continue to invest in the most efficient, fastest and reliable distribution systems by proactively installing advanced IT systems and state-of-the-art equipment. We also offer large scale logistics support for: systems development, facility equipment development, construction and maintenance. With a coverage of over 97% and more than 1,100 stores throughout Hokkaido, Seicomart has become an essential hub within communities, supporting its customers in their local areas. We will continue to enhance their values. Our fresh, safe and healthy Secoma brand products, together with other carefully selected products, reflect the needs of the local community. We also plan to expand our in-store food preparation “Hot Chef” and “Large Eat-In” where our customers enjoy a secure and comfortable place to eat our delicious food. Seicomart, where our company began, will continue delivering the joy of food with a friendly smile. (c) Secoma Company,Ltd. 2016 All rights reserved.